New Years Day… the celebrations from the night resulted in big crowds seeking nourishment. Please keep that in mind as we review the atmosphere simply as we see it. 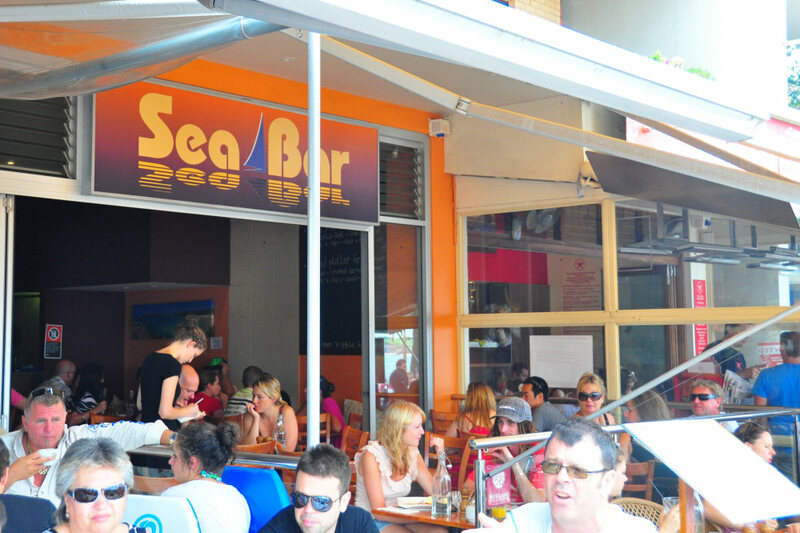 Sea Bar Cafe was busy, loud and squashed. The funky music was at a suitable volume but there were just too many tables and patrons. The wait staff were brisk and friendly though, seating us without hassle and providing menus & chilled water. We were there at midday so two of the four of us ordered from the lunch menu. 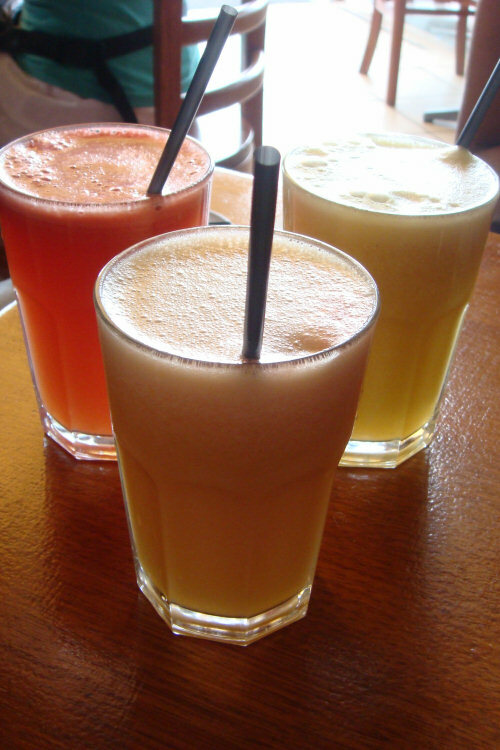 Sea Bar Cafe has a large selection of freshly squeezed juices… a much better option than any other form of fruit juice. On offer is orange, apple, pineapple, carrot, watermelon, celery and ginger (one fruit glass: $5, mixed fruit: $5.50). Bottled juices on offer are orange, apple, pineapple, tomato, cranberry and grapefruit (kids size: $3, regular size: $4). We ordered one watermelon juice, a pineapple juice and a mixed juice of carrot and pineapple. The waitress probably couldn’t hear the ‘carrot’ in our order due to the noise and we instead received two pineapples. The non-alchoholic drink menu is very large including coffees (including flavour shots), teas, juices, iced coffees & chocolates, smoothies, soft drinks, virgin marys, fruit combinations with apple & orange juice and spiders. Spoilt for choice! The coffee was also so good, we had to get more for take away. The seasonal fresh fruit salad with honey & yoghurt ($9.90) was fresh as promised and made a great accompaniment to the savoury dishes. 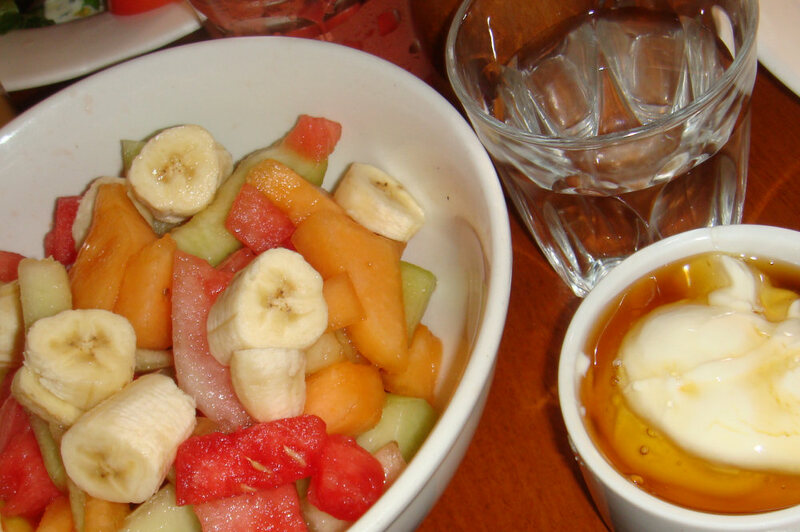 Combined with the honey and plain yoghurt it whet our appetites for more! 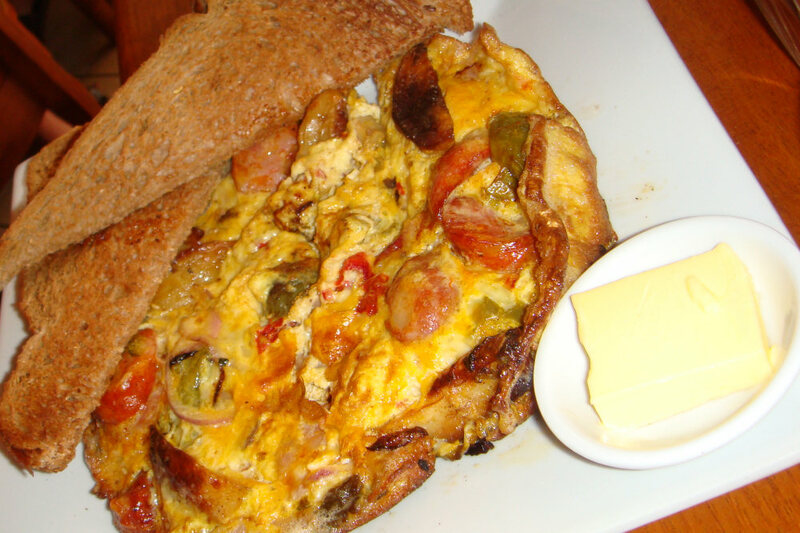 The Spanish omlette ($13.90) is a hearty, filling dish with a lot of flavour. It contains chorizo, onion, potato, capsicum & cheese and is served with a side of toast. The flavour combination is great however I wanted more of the potato. It was so beautifully herbed yet there was only one piece! There were ample amounts of all other ingredients and this would probably be ordered again if we returned! The Big Brekky ($15.90) at Sea Bar Cafe lives up to its name. Enough to fill even the hungriest patron, there were also some unusual inclusions on the plate. 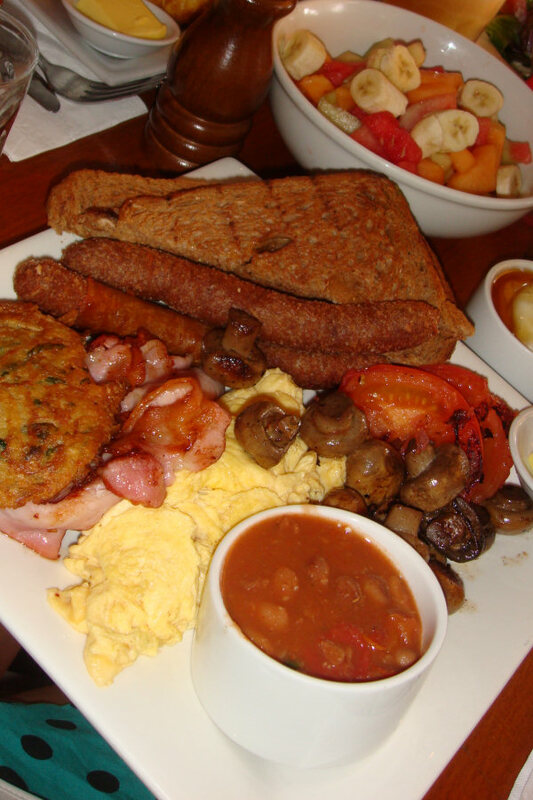 It consists of scrambled, fried or poached eggs, bacon, mushrooms, tomatoes, a hashbrown, sausages, baked beans and toast. The sausages while not deep fried, had a thin fried coating and a great juicy snap when biting. Better than your average sausage and a nice change from the norm. 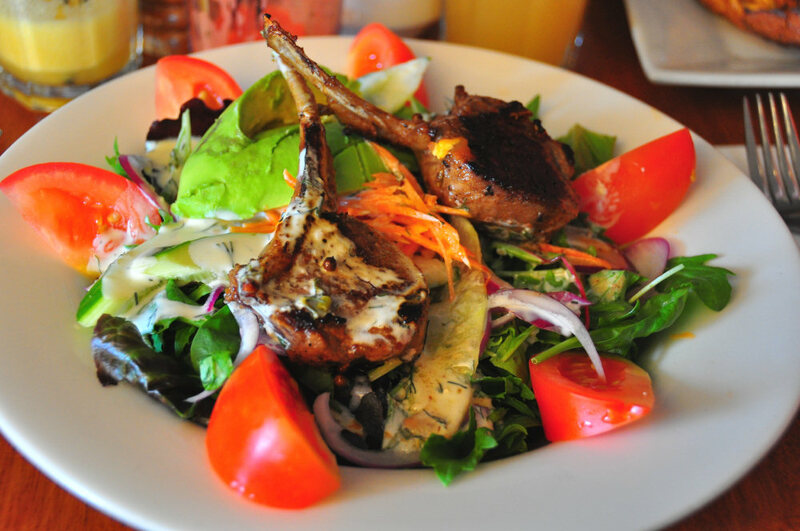 The lamb cutlet salad ($18) was a hit with tender, well cooked lamb that had been marinated in charmoula. The ingredients were fresh and the dish was topped off with a subtle mint yoghurt dressing. 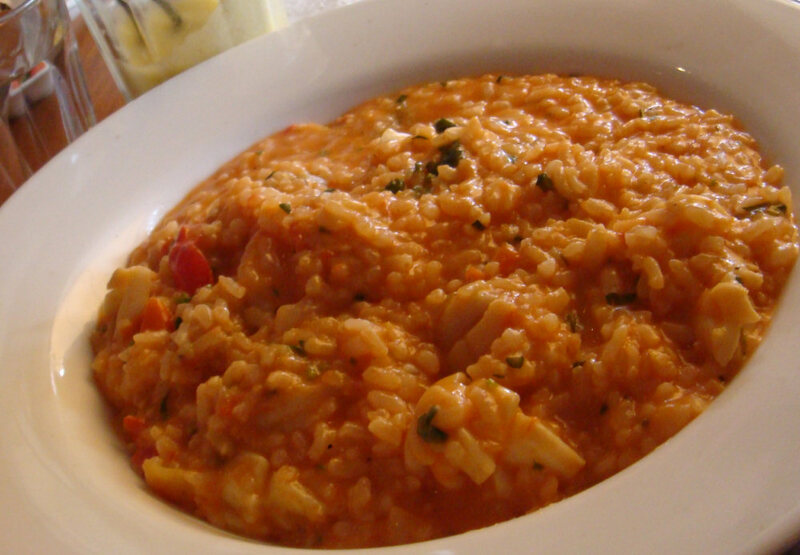 Overall a busy but enjoyable experience the food at Sea Bar Cafe has enough to bring us back. Situated directly on the beach front street of Dee Why it also features glorious views, a friendly force of wait staff and a selection of good food and drinks to please everyone. This entry was posted in Sydney - North Shore and tagged Outdoor seating, Water views. Bookmark the permalink.